FYI: What was once run out of a spare bedroom with his wife, has since exploded into a full-time ministry centering on the nationally recognized "Lunch With the Lord"—a weekly event seeking to unite all denominations through praise. Terry has sold 500,000 CDs independently, including 250,000 copies of his INO Records debut Visit Us. 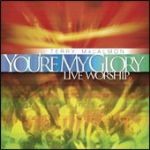 Bottom Line:Inspired by Psalm 3:3 and recorded live at Terry’s annual Pike’s Peak Worship Festival near Colorado Springs, Colorado, You’re My Glory is powerful in its praise and triumphant in its declaration of God’s glory. A great CD for personal worship times and a wonderful resource for worship leaders searching for new songs for corporate worship.